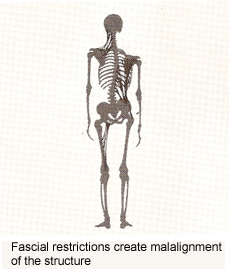 How do I know if I have Fascial Restrictions? If you answer yes to one or more of the questions below, more than likely you have fascial restrictions. Have you ever had a trauma or injury? Do you sit for long periods at a time? Does inactivity create more discomfort ? Can you feel tight fibrous bands when you touch certain muscles? When a person experiences a traumatic event, (i.e. car accident or fall), the body in an attempt to protect itself, creates a disassociation of the event. The energy and memory become trapped in the body. The body then walls off the area and surrounds it with layers of fascia. These tangled layers of fascia put pressure on nerves and muscles, eventually limiting movement and causing pain. Traditional modalities and medication will address symptoms, but are unable to heal these wounds. 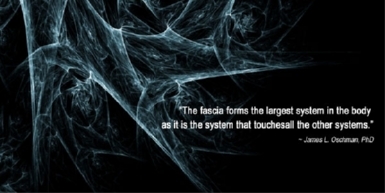 Instead over time more and more fascia forms creating enormous pressure up to 2000lbs per square inch. With Myofascial Release, the therapist follows the fascia layers, barrier thru barrier with hands on pressure contact for 3-5 minutes. This is done over several areas and can create a burning type sensation. This serves to lengthen the tangled web of fascia, reducing the layers and releasing the pressure on pain sensitive structures. For more extensive traumas, I incorporate Myofascial Unwinding. With this technique, during the precise moment the body exacts the position of trauma, the cranial rhythm stops as the trauma is brought to conscious awareness. For many this is a deeply profound experience as repressed emotions, memory and trapped energy become released. Both Myofascial Release and Myofascial Unwinding have become enormous tools in relieving long held chronic pain patterns.